BIG on food, holidays and fun! Like this recipe? Share it with your friends and family. 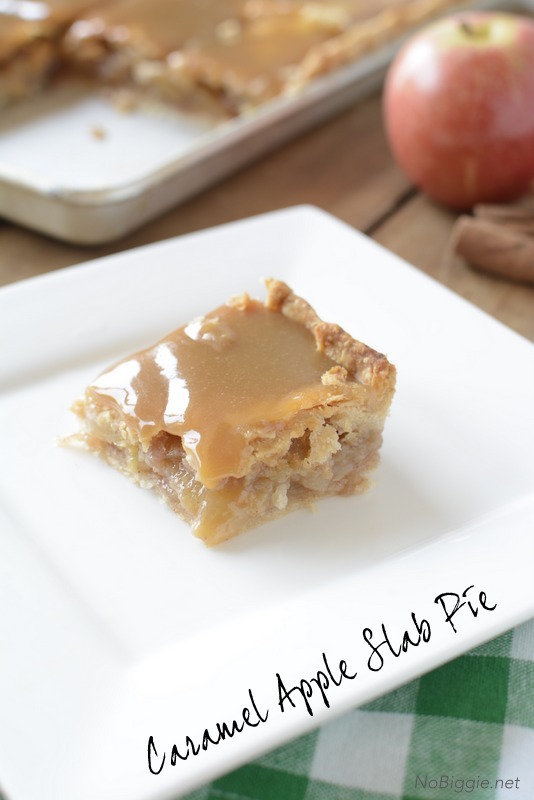 Feed a Crowd with this Caramel Apple Slab Pie. It’s so good! Happy Fall! I’m looking forward to everything that comes with Fall…the beautiful colors of the changing leaves, crisp cool air and the food (of course!). 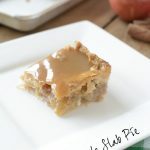 This recipe for caramel apple slab pie has Fall written all over it! 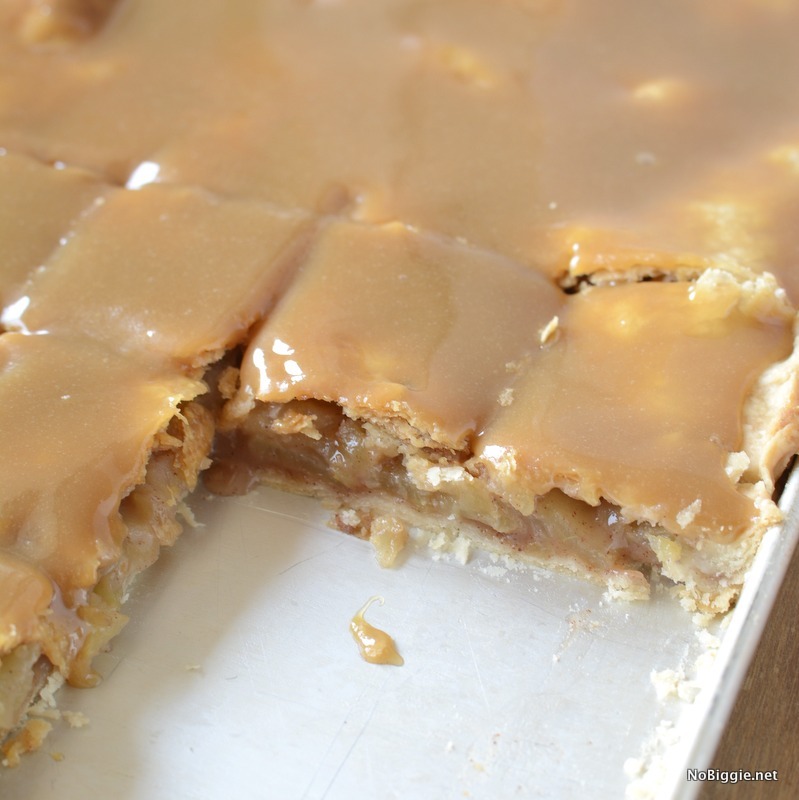 It’s like your favorite apple pie on a big sheet pan covered in a delicious caramel sauce. It’s great for feeding a big group. 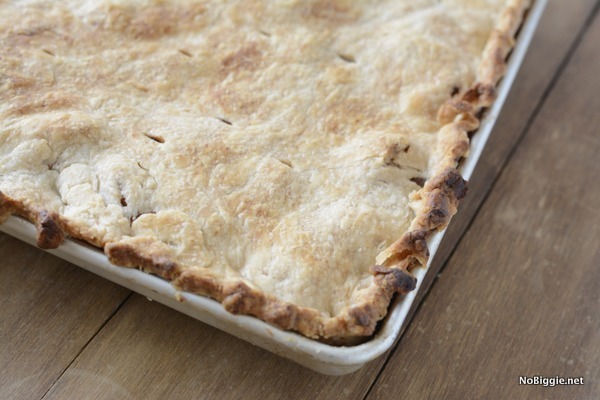 This apple pie recipe includes a variety of different apples which gives it such a great taste. I mean c’mon! 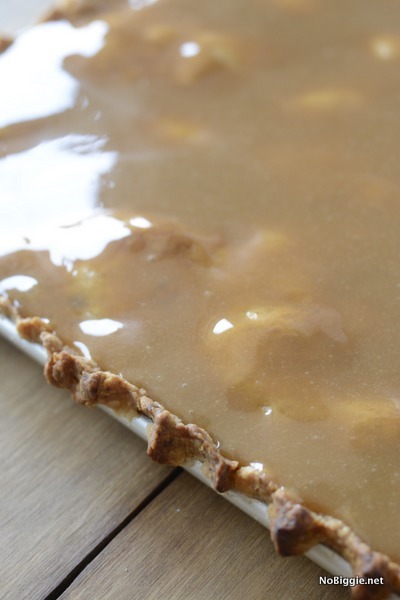 Just look at that gooey caramel top. To prep all your apples, you’ll need the coolest gadget ever…the Apple peeler, slicer corer. and what it looks like all golden brown. In large bowl, mix sugar, 1/3 cup flour, the cinnamon, nutmeg and 1/8 teaspoon salt. Stir in apples until well mixed. Let sit while you make the pastry. In a medium bowl, mix flour, salt and sugar. Cut in shortening, using a pastry blender (or pulling 2 table knives through all the ingredients in opposite directions), until particles are the size of small peas. Sprinkle with cold water, 1 tablespoon at a time, tossing with a fork until all flour is moistened and pastry almost cleans the side of the bowl (1 to 2 teaspoons more water can be added if necessary). 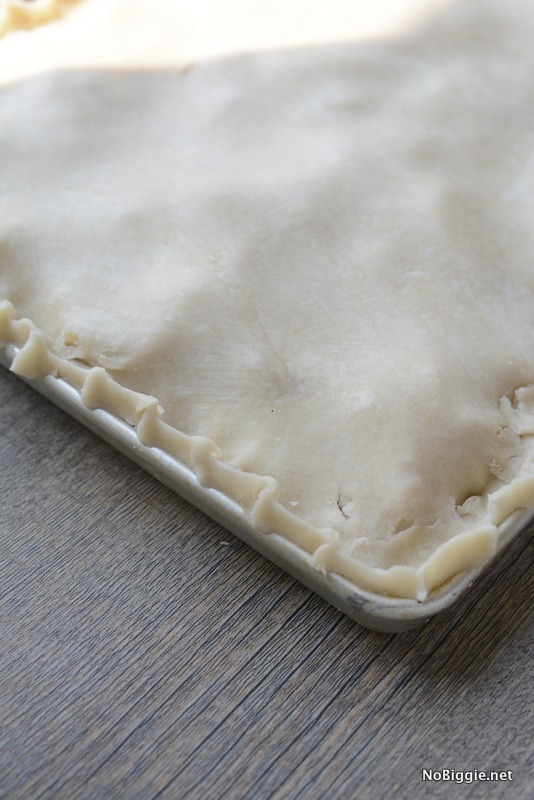 With a floured rolling pin, roll one pastry rectangle 2 inches larger than your large pan. Fold pastry into fourths; place in pan. Unfold and ease into pan, pressing firmly against bottom and side. 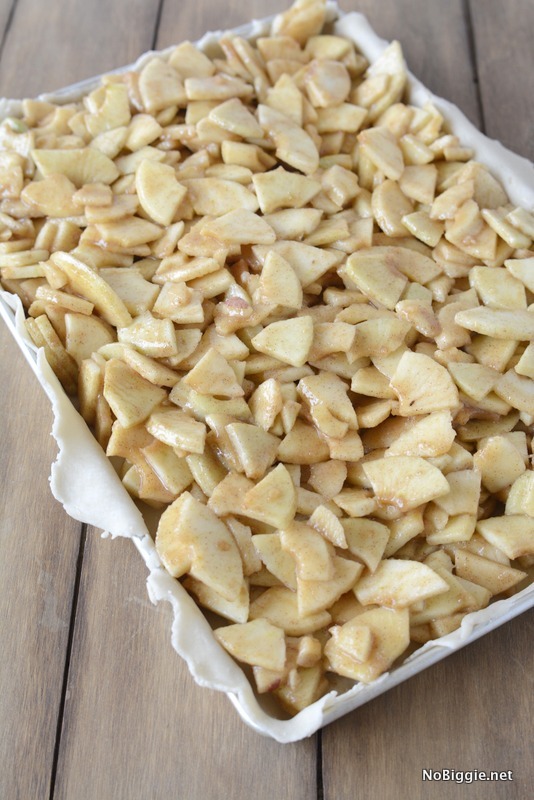 Place apple filling in pan. Roll out second rectangle and top apple filling. Pinch edge to prevent leaking and add a decorative look. Cut small slits into the top of the crust so steam can escape. Cover the edges of the crust with strips of aluminum foil to prevent over browning. Bake for 40 - 45 minutes. For the Caramel topping: Cook the first four ingredients over medium heat, stirring constantly until it thickens. Add the butter and vanilla. 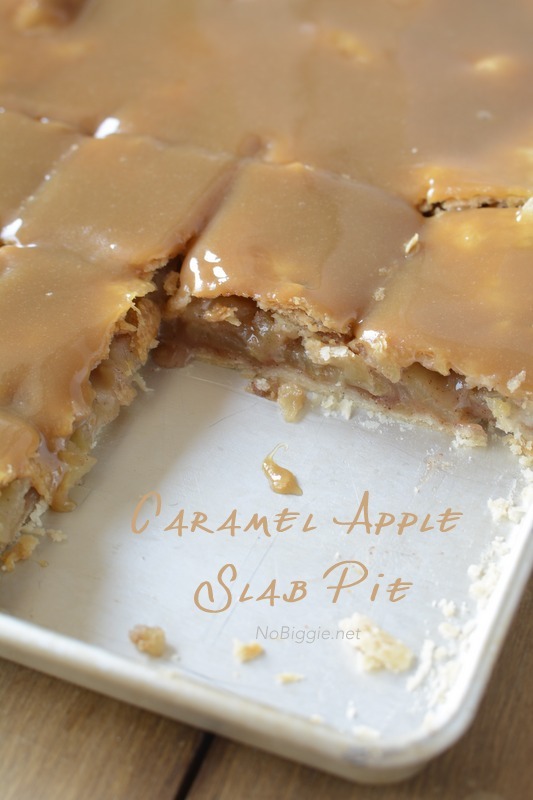 Spread over the slab pie and let the caramel set for a few hours. *Note this entire recipe is increased by 1 and 1/2 times to fit a half sheet pan (12 1/2 x 15 inches in size). Making This Recipe? Tag us on Instagram: @NoBiggie using the hashtag #NoBiggieRecipes, so we can see what you are making in the kitchen! Once set, you can cut them into squares to feed a crowd. It’s up to you how big you want each piece to be. 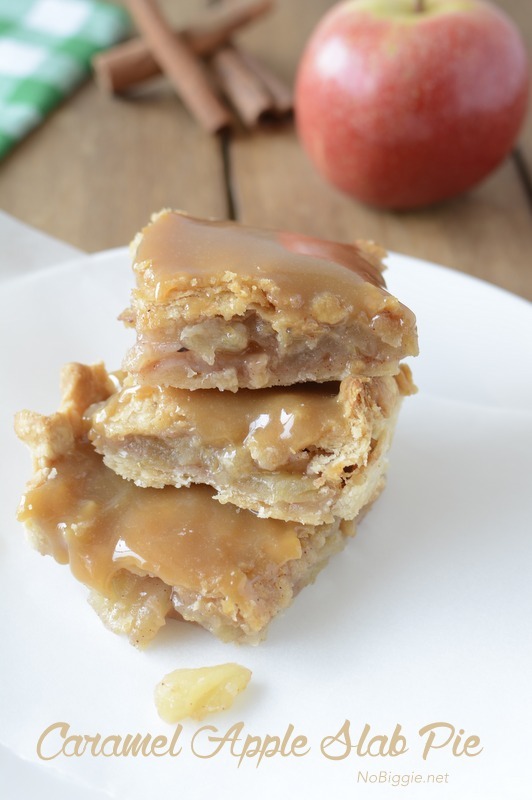 You’ll have to try this recipe for Caramel Apple Slab Pie this Fall! © 2007–2019 NoBiggie by Kami Bigler. You're welcome to link to this site or use a single image and brief description to link back to any post. Republishing posts in their entirety is prohibited without permission.